Zermatt Switzerland, home to the iconic Matterhorn, is also home to world’s highest 3S cableway. 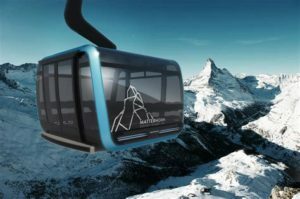 Zermatt’s Matterhorn Glacier Ride transports 28 skiers and passengers up to 3,821 m, 12,700’ in 9 minutes in stunning modern style. Opened in 2018, this $52-million Swiss Franc marvel replaces the historic Klein Matterhorn trams with 25 speedy scenic cabins, swank interior cabins designed by the likes of Maserati and Ferrari. Will you want to wait for one of the sparkling Crystal Ride cabins bejeweled with thousands of Swarovski crystals and a floor that becomes translucent during your ascent, or are you just stoked to ski to Italy’s Cervinia from Zermatt’s summit for lunch? Engelberg Switzerland’s Titlus Rotair is the world’s first fully rotating gondola to Engelberg’s 10,524’ ski summit in central Switzerland. 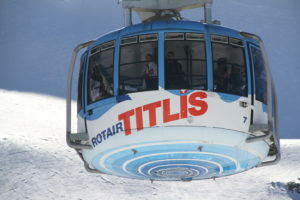 This truly “revolutionary” lift – the Rotair bubble – makes one slow 360 spin during the five-minute ride from the mid station at Stand up to the glacier, offering amazing panoramic views of steep ice fields, crumbling crevasses and the surrounding Alps. Don’t be surprised if your circular car is full of photo-snapping Asians, and don’t worry – they aren’t equipped to ski, just to see snow, take a selfie and take the Rotair back down. St Anton and Ski Arlberg have 88 amazing Austrian lifts, this is Doppelmayr design country. The Galzigbahn from village St Anton village looks like a showcase Ferris Wheel. 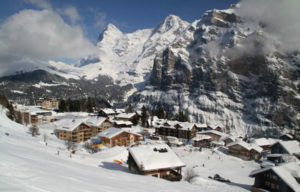 The 2-mile jaw-dropping Valluga Bahn I and II are tremendous high elevation lifts to 9,222′ steeps and sensational views. The Arlberg region recently spent $400 mill in lifts to create the largest ski resort in Austria. The Flexenbahn 10-person gondola connects Stuben to Zürs, intersecting seemlessly with the Tritkopfbahn. The Auenfeldjet gondola opens Lech/Zürs to Warth/Schröcken skiing. St Anton has cool lifts, and the best après ski in the world! Ischgl Austria has mind-blowing lifts in all directions, its a Doppelmayr dreamscape with so many bubble-covered heated leather chari 8 pack and beautiful gondolas and cable cars. Ischgl’s 150-person Piz Val Gronda to 2,812 meters with floor to ceiling windows over the Austrian alps. Ischgl’s Swiss neighbor Samnaun has the world’s first Double Decker Tram that holds 180 passengers and climbs from the village up 700 meters, 2100′ vertical feet. Verbier’s Mont Fort tram is venerable. This Swiss lift reaches Verbier’s 3,308 m summit, 10,853’ to a glorious panorama and platform viewing station. You can see Mont Blanc, The Matterhorn, most all the Alps from this haute point. That’s the easy part, the 8,239’ ski run from atop Mont Fort (which translates to “strong mountain” – yeah, no joke) all the way down to the hopping town of Verbier for après ski…that’s a little more challenging. In fact, the steep trail “Bec de Rosses” is home to the Extreme Freeride World Cup Finals, and the World Speed Skiing Track. Another option is to ski to Swiss cheese fondue, which is to die for – almost literally, on a precarious goat path leading to Cabane du Glacier Tortin. Arosa Lenzerheide’s Urdenbahn Tram connects two massive ski peaks, and two ski regions in a swift 3-minute ride. The platforms move, and the two trams operate completely independently, so enjoy that technology – and the spectacular scenery as you ski back and forth (on the same ticket) between Lenzerheide and Arosa. 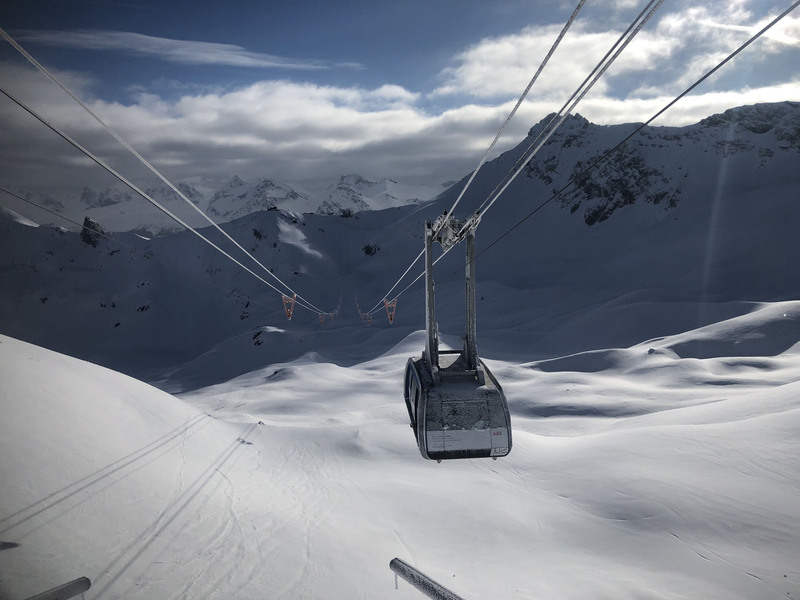 The Rothorn Tram in Lenzerheide is impressive too, climbing 1,910 to 2,865 meters (9,400′) to spectacular views on a wild peak, and skiing through tunnels from the summit – only in Europe. 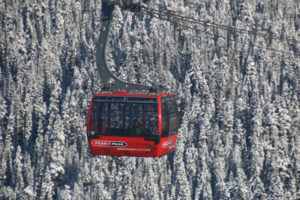 Whistler Blackcomb’s Peak 2 Peak gondola holds the record for the longest unsupported span lift. This 2008 Whistler Blackcomb aerial tram spans 4.4 kilometers, 3.7 miles across, connecting the two massive Canadian ski resorts, all on one ticket – now a Vail Resort so also on the Epic Pass. It’s a 11-minute comfy ride from Whistler’s Roundhouse Lodge to Blackcomb’s Rendezvous Lodge with great views out the big glass window walls, and the floor if you score a glass bottom cabin. 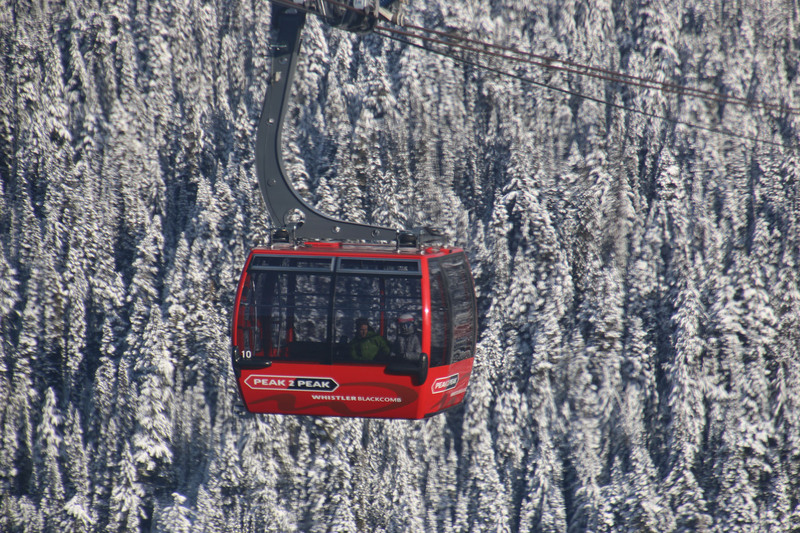 Peak to Peak is also the highest lift hovering over 1,430’ above the valley floor, not for those afraid of heights. Wouldn’t want to be emergency evacuated off this one, rather be at Whistler’s awesome apres ski. Jackson Hole’s tram is legendary, dubbed by locals “Big Red” or the “Red Heli” since it transports skiers base to summit to Wyoming’s wild steep off-piste skiing. The 100-person bright red Tram was revamped in 2008 after 40 years of service. Lines form for “first box” early morning with J-Holers locals, and the music blares on your 9-minutes scenic ascent to 10,465’. Skiing from Rendevous Peak is all natural, ungroomed, gnarly, steep, the longest continuous skiable vertical in US at 4,139’. Did we mention you can download Big Red instead? 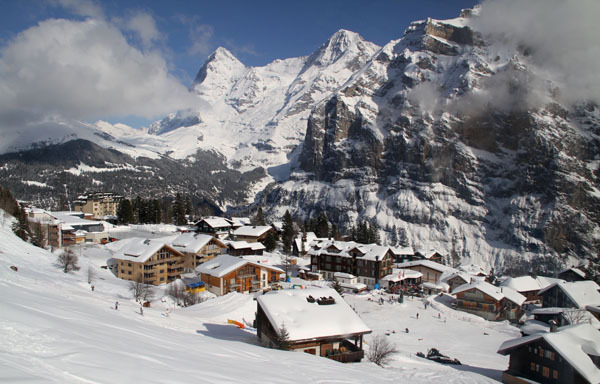 The Jungfrau of the Swiss Alps is home to beautiful skiing at Wengen, Murren and Grindelwald, think James Bond in “Her Majesty’s Secret Service.” The Railway Kliene Scheidegg above Wengen and Grindelwald is the highest and most amazing railway lift to the Jungfraujoch at 3,454m, 11,332’ – the highest rail station in Europe. While there aren’t ski trails from here, extreme alpinist do descend from here – don’t even think about it! Instead, we suggest you ride the spectacularly scenic train, then have lunch at Eiger Glacier restaurant behind the Jungfraujoch train at mid-station for its stunning glacier views and delicious pastries and chocolates made at 7,612’. From here you can ski Kleine Scheidegg-Männlichen vast ski slopes. 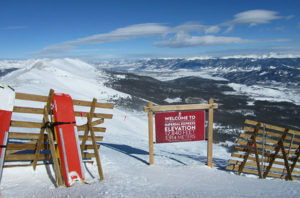 Breckenridge in Colorado offers the highest lift-served terrain in the US. The Imperial Express quad delivers skiers and riders to 12,840’. Nothing fancy, in fact it’s kind of wild and typically windblown at Breck’s summit, but usually snow loaded as you ski down Whale’s Tail, Lake Chutes or Snow White. The hike to the tippy top (if you opt to) to 13,000′ from the unload of Imperial is “breathtaking” with a steep boot pack climb to the tattered American flag at the scenic, wind-scoured summit. You’ll earn your apres ski tall one and tall tales at Breck. 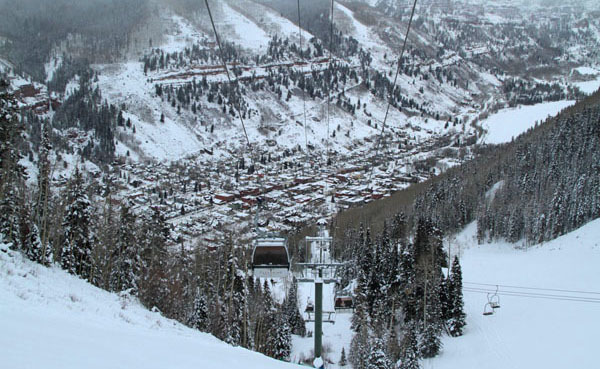 Telluride’s multi-stage gondola is cool in Colorado. 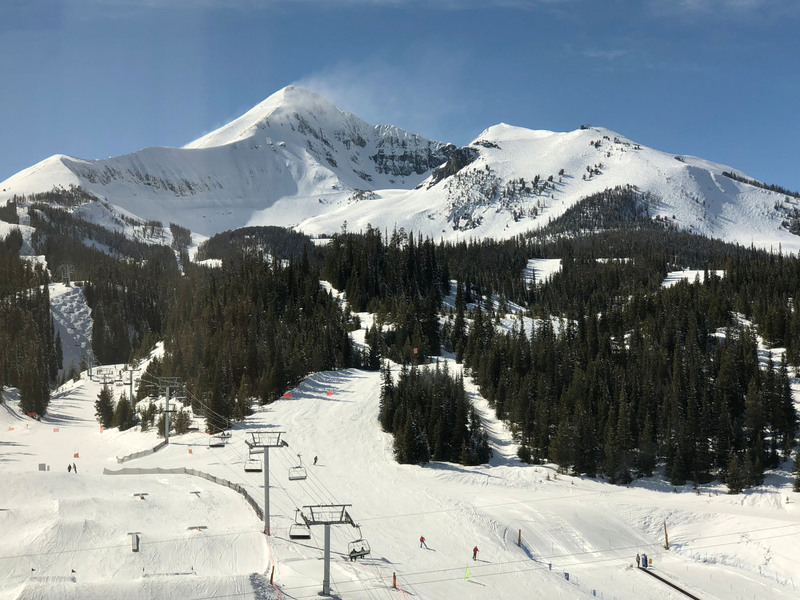 The 8-mile, 13-minute ride takes you from the historic mining town up to 10,540’ to skiing and the highly scenic swank Allred’s Restaurant, or stay on to continue to Telluride’s Mountain Village for more ski lifts and a skiers pedestrian plaza (this is where we like to lodge slope-side). You can even ride to the next phase – Tellluride’s free parking lot and post office. Our favorite is riding the Gondi into town at night (sans ski boots), descending on the box canyon village with its twinkling lights for après ski, and the return ride under cozy blankets back up when you’re fueled up from Telluride’s drinking and dining. 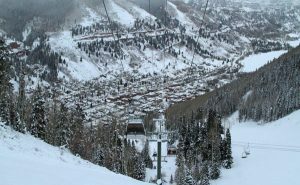 Where’s your favorite ski lift? And don’t tell us it’s the Matterhorn at Disneyland or Harry Potter World at Universal.